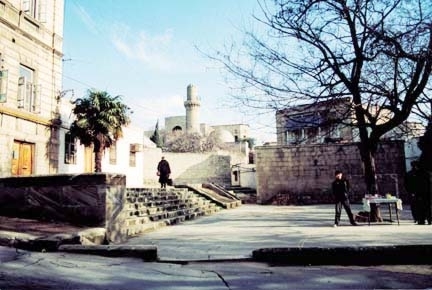 Ichari Shahar (pronounced i-char-I sha-HAR) literally means "inner city", the area of Baku defined by the citadel wall that surrounds most of it. 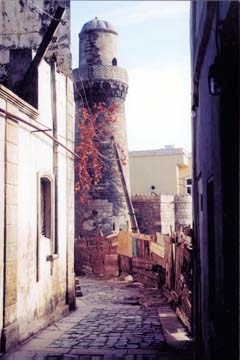 Foreigners refer to it as the "Old City", since it's the oldest section of Baku. 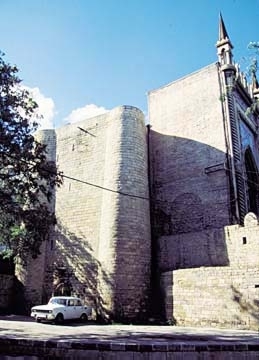 Many Azerbaijanis believe that the Inner City as well as the Maiden's Tower inside it were built in the 12th century. 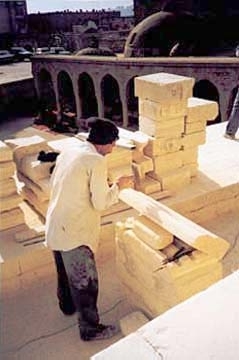 According to some researchers, however, construction may date back as early as the 7th century. The question has not been completely settled. Even though its streets are neutral - toned with browns, beige, gray and an occasional white, artists invariably depict Ichari Shahar with a vibrant rainbow of colors - as if attempting to capture the excitement of its lively crooks and crannies. Ichari Shahar's character has changed considerably since Azerbaijan's independence. Commercial ventures have started to spring up, and the medieval town has attracted a great deal of foreign investment. Yet there are still relatively few tourist shops or restaurants in its winding streets. Perhaps that's part of its charm - it's still a private, friendly space that many Azerbaijanis call home. 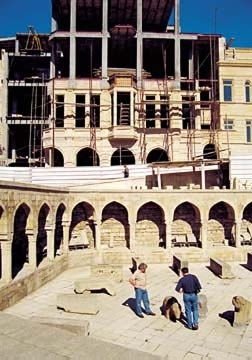 When we interviewed artist Mir Teymur (1947-), who has lived in Ichari Shahar for the past 30 years, we asked him to reflect on the changes he has seen in Baku's medieval Inner City. He talks about the community's struggle to maintain its unique character and sense of history, a struggle that sees more defeats than victories. Yet Mir Teymur believes that the essence of Ichari Shahar is still intact - as long as you look closely enough to find it. Every stone in Ichari Shahar bears witness to thousands of years of history. One has to listen to it, to pay attention. Some people sense its history; others just pass by without understanding anything at all. Photos: Typical views from Ichari Shahar (Inner City) which is believed to have been established in the 12th century or earlier. The charm of the heart of Baku has yet to be discovered by many tourists. Photos: Litvin and Khanlou. I have so many fond memories of growing up in Ichari Shahar. I loved its narrow streets and old houses with their overhanging balconies. One of my favorite things was playing soccer with friends. Of course, it was impossible to play ball in those narrow streets, so we kids would gather in a nearby square. Another favorite game was playing tag. We played it on the roofs of houses. We would chase each other across the flat roof tops and laugh when the owners would come out and shout at us. During the Soviet period, we celebrated Novruz (the traditional Spring Festival in the region - March 21) in secret because it was prohibited by the government as it was associated with nationalism. One popular Novruz tradition is for kids - especially the boys - to build bonfires and jump over them. We could only build bonfires in the narrow streets - not the major ones, for fear of being caught. Today, children in Ichari Shahar still jump over bonfires at Novruz. Today, they can do it openly. Another wonderful thing about Novruz was the smell of sweets like "pakhlava" (baklava), "shakarbura" and "goghal". People would give these treats to their neighbors and relatives. I remember how my grandmother would set aside time each year especially to prepare Novruz treats. We had another tradition of giving food - especially kebab - to our neighbors. It wasn't that our neighbors were poor, or anything like that. It was just a matter of friendship. This tradition is dying away, however. One of the sounds I associate with Ichari Shahar is the mugham music that seemed to float out of every open window in the summertime. Unfortunately, these days I don't hear this lovely national music coming out of windows; instead, there seems to be all sorts of foreign music - very little Azerbaijani. Another sound I remember was that of people playing "nard" (backgammon) - the sound of dice rolling across the board and the sliding and clicking of the round playing pieces. When it was warm outside, men would gather to play a game or two. These days, people don't play backgammon that much but I still enjoy inviting friends over and playing it at home. In the past, I used to see so many familiar faces on these streets. Nearly everyone I passed, I knew. Now most of the natives of Ichari Shahar have moved to other places. It's rare to see as many familiar faces any more. On the street we used to say "Hello" to each other even if we didn't really know each other. That was the tradition. Sadly, too, this tradition is disappearing, too. There's another distinction to Ichari Shahar - the moral and spiritual unity of the community. If a person died and the relatives were mourning, I used to stop in to pay my respects even if I didn't know the family. Somehow, people felt connected to each other and sensed a duty to reach out to one another. I wasn't the only one - all of the people here felt united in the same way. We felt united to each other and to these familiar alleys and buildings. There used to be a very old mulberry tree that defined the square which came to bear its name - Tut Aghaji Meydani (Mulberry Tree Square). That tree would spread its shade and stain the pavement with its fruit every summer. Then a few years ago, a big wind came along and uprooted it. The man who lived next door cleared the trunk and branches away and decided to plant a young mulberry tree in the exact same spot as the old tree. He didn't want the square to stop living up to its name - it was important to him to maintain that history. Situations like that offer reassurance that the spirit of Ichari Shahar lives on, despite all of the changes. 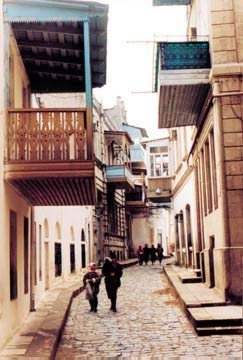 Ichari Shahar, though very small and compact, has many kilometers of winding lanes and alleys, which can best be enjoyed on foot. I like people to understand the various levels in the old city first. There's really quite a significant slope from sea level up to the its highest point up to the inner walls of the Academy of Science Presideum. I start at Gosha Gala Gapisi (Double Tower Gate) and show them various streets until we reach the Shirvanshah Palace. From there we go on to Yeddi Gumbaz (Seven Domes) of the old bathhouse. Up the hill from Mulberry Tree Square is the highest point in Ichari Shahar, guarded by Jebahan Tower, now called Sinig Gala (Broken Tower). When Peter I ruled Russia in the 18th century, military forces entered Baku and attacked the city from two main points - Maiden's Tower on the waterfront and Jebahan Tower at the highest peak. You can still see places on Maiden's Tower where the artillery fired against it. Maiden's Tower withstood the attack, but Jebahan Tower was destroyed. To this day, it is known by the local residents as "Broken Tower." My favorite place of all in Ichari Shahar is the Maiden's Tower. I often climb its winding staircase the eight floors to look out over the city. Ichari Shahar is divided into eight main districts, which are said to have been established in the Middle Ages. One of them is called "Seyids", which refers to the relatives of the Prophet Mohammed. Hajis (those who had been on a pilgrimage to Mecca) lived in this block as well. Another section is called "Aghshalvarlilar" (literally "white-trousered ones" which refers to those who have made the journey or hajj to Mecca). Another block is called "Bozbash yemayanlar" (those who do not eat "bozbash"). Bozbash is an Azerbaijani dish made of chopped meat, peas and potatoes mixed with spices. Other blocks were for "Lodkachilar" (Boat men), "Hamamchilar" (Bathhouse workers), "Arabachilar" (Wagoners), "Juhud Zeynallilar" (Jewish Zeynallis) and "Noyutchular" (Oil men). One last block is called "Shahgaldilar", meaning "the shah came." Some of the names define occupations of their early occupants; others, obviously, carry some humor that is lost on us today. Nevertheless, these names are still preserved in Ichari Shahar, despite the fact that there are fewer and fewer natives actually living here. Many people are moving away - not because they want to, but because they can sell their property and live comfortably elsewhere, for example, in Gunashli. Of course, they can't be blamed. They don't have a lot of money, so they're forced to sell their houses during these difficult economic times. Still, there are some who won't move, no matter how much money you offer them. They are deeply attached to their roots and would rather die than move. Ichari Shahar was not built using a straightforward design. For instance, you wander down a narrow alley and suddenly hit a blind alley. Why? It's not because that was the way houses were built back then. It was planned that way. Let's say that the Gosha Gala Gapisi (Double Tower Gate) is destroyed, and invaders enter Ichari Shahar on horses. Four horses can run abreast on a wide street, but if they hit a narrow alley, the horses have to file behind each other one by one. It's a lot easier to wipe out the enemy one by one. What's the best way to stop invading forces? Build a city with winding, confusing streets and unexpected dead ends. Also, it's not easy to invade a city that can fight back on three or four different heights. Ichari Shahar was designed so that its people would be able to defend themselves from various heights above the ground. The layout of the streets in the Inner City offers other advantages as well. Throughout the Middle East, including Azerbaijan, there are dramatic temperature extremes throughout the year. In the winter, it can be 20 degrees below zero [Celsius], while in summer, it can reach 50 degrees above zero. 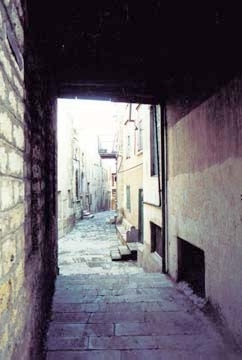 Ichari Shahar's narrow streets benefit from the considerable amount of shade cast from adjacent buildings. Furthermore, the houses' walls are nearly one meter thick which provides a natural cooling system. Ichari Shahar has changed a great deal in the past decade. Many new buildings are springing up. A few years ago, there was a mad rush by the international oil companies to refurbish old buildings and set up their offices there. This created terrible traffic jams, since these narrow streets were only built for pedestrian traffic, or occasional horses or camels. When these new buildings go up, you hear the sound of the excavator. Our Constitution says that historical places must be protected, and there is one section that prohibits the use of excavating equipment. Even if you use a spade or shovel to dig, and you come across a historical artifact or foundation, you are required by law to consult with archeologists. They, in turn, judge if you can continue your work or not. Some of these new buildings have been built over underground water reservoirs. In early times, people knew about it and dug wells on each street so that they could have clean, cold water. We have an expression in Azeri that warns that it's a sin to cast anything into a well. The greatest sin is to cover a well with stone or soil. It's like swearing at the native land. 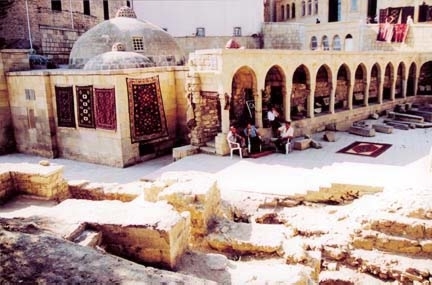 The process of destroying wells in Ichari Shahar started late in the 18th century and reached its peak in the 19th century, when Russian factories and the British came here in 1840. The British came here in order explore resources. 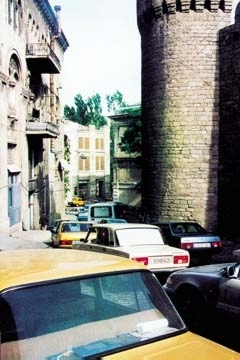 Baku became a crossroads - which had its good sides and its bad sides. At that time, the Russians occupied the whole wall from Gosha Gala (Double Tower, where the double gates are located) and made a stable alongside it. After they left, the Soviet government established itself (1920). The Soviet built a shoe factory inside Ichari Shahar. What was that all about? We couldn't breath fresh air. We coughed and choked. Of the new buildings being constructed today, most do not fit the pattern of architecture peculiar to this part of Baku. Actually, this process started long ago, not just when we gained our independence in 1991. The trend started as early as the 1970s. It used to be that people were afraid of destroying the buildings here. During the Soviet period, top officials were afraid they would lose their jobs if they gave someone permission to demolish a building. It was easy to bring accusations against someone for such an offense in the newspapers. So out of fear, Ichari Shahar retained much of its medieval character. Of course, it would be better if people at that time had acted out of conscience rather than fear. These days, people don't act out of either - fear or conscience. Any building can be sold. In some cases, people are building new houses instead of restoring the historic ones. This totally changes the appearance of Ichari Shahar. I don't have anything against people moving here. But I would like them to care about Ichari Shahar and not destroy its history. The house I live in is more than 100 years old. It's a very warm place. I don't mean "warm" in the physical sense, but in the way that it gives the people who visit a comfortable, friendly feeling. People who stop by this house for just 10 minutes find that they don't want to leave it for a long time. This is the secret of my house. It's the secret of Ichari Shahar, too. You come and you want to stay for a long time. Mir Teymur studied at Azerbaijan State Arts School and the Leningrad Arts-Industrial College. In 1972, he joined the art faculty at the Leningrad Institute of Theater, Music and Cinema. Mir Teymur was interviewed by Mazahir Panahov and Farida Sadikhova.